Step 2: Select "Ticket Issue" (the icon at upper left) unless you're paying for a bicycle, changing a reservation, picking up a ticket that you bought online, etc. 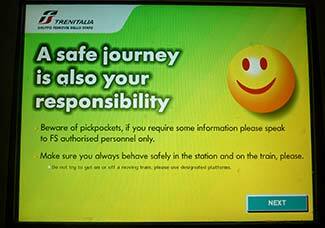 Step 3: This informational screen warns you against pickpockets and unsafe behavior in the station or on the train. Simply click "Next" to continue. 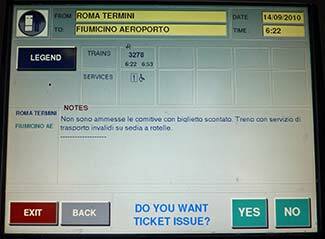 Note: By default, the machine assumes that you're departing from the station where you're buying a ticket--in this case, Roma Termini, which is shown in the yellow box at the top of the screen. 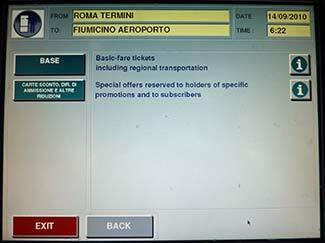 Note: Trenitalia tickets are normally valid for two months from the date of issue. 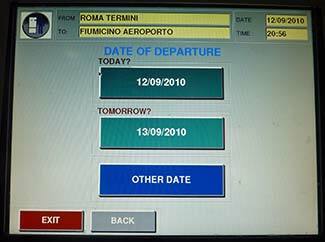 Step 6: If you chose "Other date" in Step 5 (as we did), you'll see this screen. 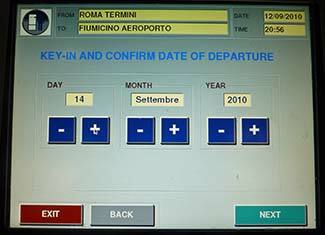 Use the - and + buttons to adjust the date, month, and/or year. Then click "Next" to continue. 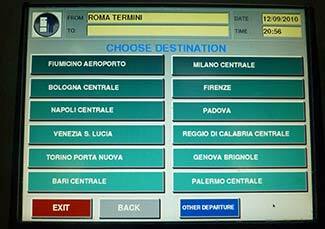 The times are based on a 24-hour clock: "00-06" means "midnight to 6 a.m.," for example, while "20-22" means "8 p.m. to 10 p.m."
Step 8: This "Choose Preferred Train" screen shows a timetable of departures to your destination during the time range that you've chosen. Click a time, or click either of the blue buttons. 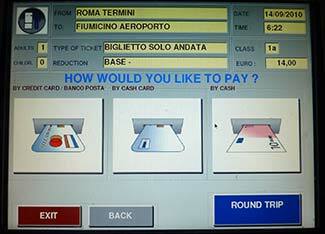 Step 9: Click "Back" if you want to change your selections, or click "Yes" if you're ready to buy a ticket. Step 10: Click "Base" unless you have a special promotion code. 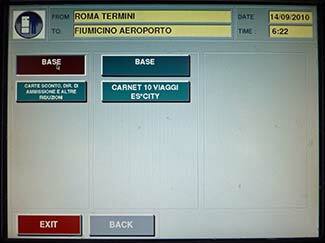 Step 11: Click the blue "Base" button at right unless you want a carnet of 10 tickets. 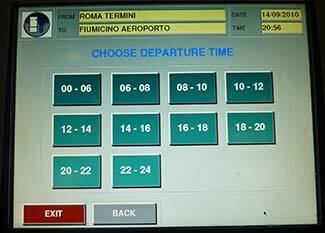 Step 12: Select the number of adult passengers and children from 4-12. (Children under 4 travel free.) 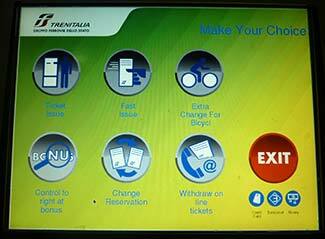 Then click the large green button under "Tickets" to continue. 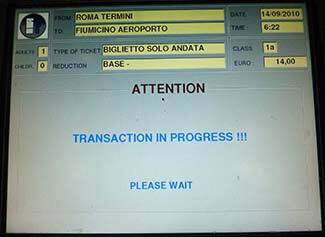 Note: "Biglietto solo andata" means "One-way ticket." 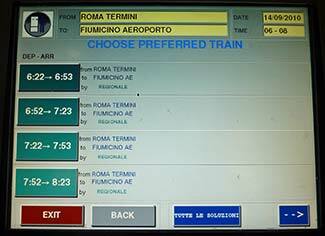 If you want a return ticket, click the blue "Round Trip" button. 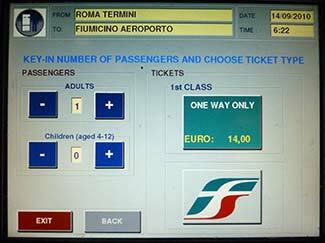 Step 14: Unless you have a Trenitalia loyalty card or agency number, click the blue "Nessuna Carta" button. Step 15: Follow the payment instructions. 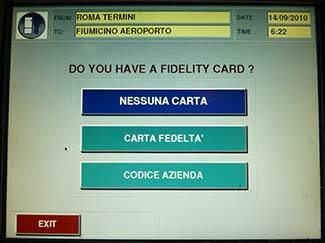 In this case, we were told to insert our credit card as indicated in the diagram. 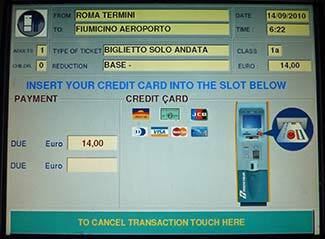 Good news for overseas visitors: Unlike ticket machines in some other European countries, such as France, the Trenitalia machines will accept U.S., Canadian, and other magnetically-striped credit cards without microchips. 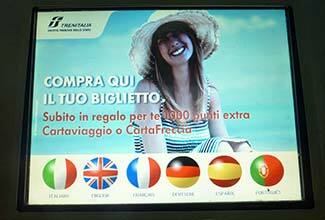 Step 16: Wait while the machine processes your payment. 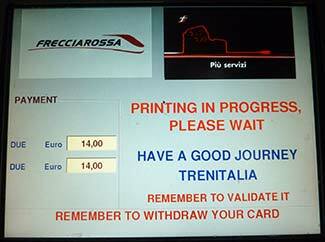 Step 17: After processing your payment, the machine will print your ticket. 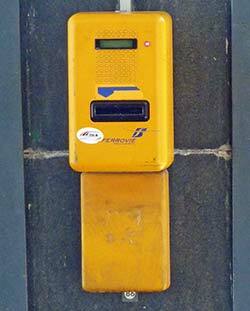 Step 18: Remove your ticket from the receptacle on the front of the machine. Don't forget this step! 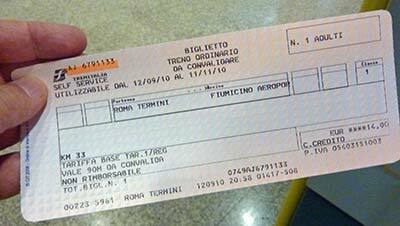 If the train conductor sees that your ticket isn't stamped, you may be charged a hefty fine.